Port Royal Golf Club is cuddled by the Atlantic coastline, is located on the northwestern point of Hilton Head Island, named one of the “Top 75 U.S. Golf Resorts” by Golf Digest Magazine. The Club is situated in the Port Royal Plantation along with the luxurious oceanfront Westin Resort. In addition to being praised for its unrivaled golf experience, it is also well-known as a world-class tennis destination. 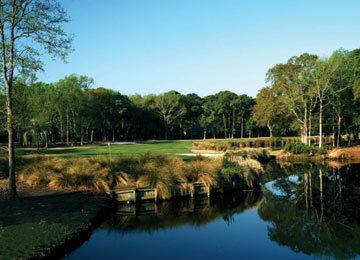 The Barony Course was designed by George W. Cobb in the early 1960’s and was one of the first courses on the Island. From the tee box, many of the holes appear to be relatively open, but as you approach the newly resurfaced Bermuda greens, the real challenge becomes clear. The greens are generous and protected by thick rough and unforgiving bunkers, entitling the golfer to have good touch with mid to short-range iron shots. This is a course where accuracy, not length, is paramount. Robber’s Row was designed in 1967 by noted architects George W. Cobb and Willard C. Byrd, and was redesigned in 1994 by world famous architect Pete Dye. The course is located on the scenic marsh side of the Port Royal Plantation and cuts through beautiful strands of magnolia and live oaks. This course sets atop former Civil War grounds and features historical markers throughout the course, describing events which took place on the Island. Although tee-shots have generous fairways to land in, approach shots require accuracy to the well-protected greens. Robber’s Row is a course rich in history and challenge to any golfer. Planter’s Row was designed by Willard Byrd and built in 1984. This 18-hole course was the Plantation’s third course and played host to the Hilton Head Seniors International Golf Tournament, a former Champions TOUR event. This course offers a different look from its sister courses, with rolling, tree-lined fairways in a park-like setting. Water comes into play on several holes, and its large and undulating greens require a skilled touch with the putter.